If you want your kids to learn how to actually feed themselves someday, start tonight. The younger the child, the more enthusiastic they’re likely to be about helping. And when kids pitch in on dinner, they’re more likely to want to eat it. 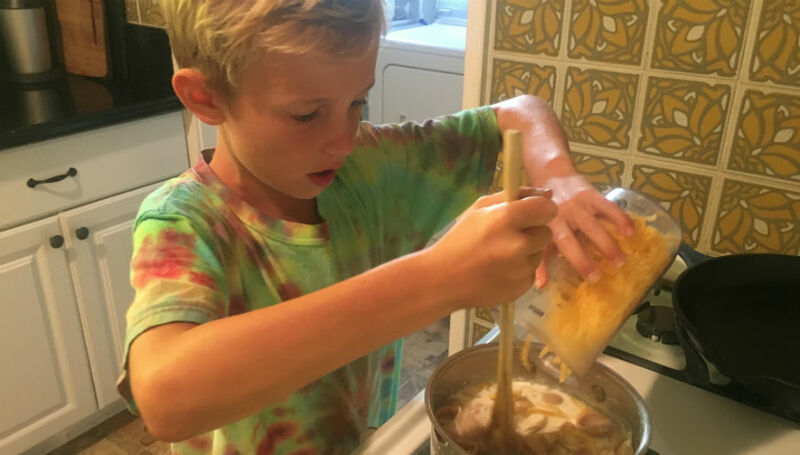 Granted, most kids under 10 aren’t ready to operate the stove or chop veggies on their own, but kids six and up can be taught to cook at the stove and use a paring knife with supervision. And even three-year-olds can use a peeler or grater with your guidance. So yeah, kids “helping” means there’s probably going to be a bigger mess when you’re done. But, as they say, you can’t make an omelet without breaking some eggs. Okay, omelets may be a little complicated as a starter meal, but little kids can crack eggs and help stir them until they’re scrambled. And here are seven more easy family dinners kids can make mostly on their own. Bon appetit! Bring 3 cups of milk and 2 cups of shells to a boil, then turn heat to low and simmer for 20 minutes. Stir in 2 cups grated cheddar, a dash of salt and 1 cup frozen peas. Use jarred sauce and it’s the ultimate heat-and-eat kid fave. More time? Make this simple recipe from Italian chef Marcella Hazan: Simmer a can of whole tomatoes for 45 minutes with a halved onion, a half-stick of butter and a dash of salt, stirring and breaking up the tomatoes occasionally, until it turns into sauce (discard onion before serving). Spoon jarred pizza or pasta sauce on English muffin halves, then sprinkle with shredded mozzarella. Bake at 400 degrees for 10 minutes. Chop an onion and saute in a tablespoon of olive oil in a saucepan over medium heat for 5 minutes. Add 1 teaspoon ground cumin, 1 cup rice and 2 cups water and bring to a boil, then cover and simmer for 15 minutes. Stir in 3 cups (two 15-ounce cans, drained) black beans and 1 cup frozen corn. Poke 4 potatoes with a fork. Microwave potatoes on high for 5 minutes, then turn and cook for another 5 to 8 minutes. Microwave 2 cups of frozen broccoli florets on high in a glass bowl filled with a little water for 4 minutes. Slit the potatoes lengthwise and add broccoli and grated cheddar to each potato. Over medium heat, bring a halved clove of garlic, 2 peeled and cubed sweet potatoes and 2 cups of vegetable or chicken broth to a boil, then simmer for 30 minutes. Discard garlic clove halves. Add a dash of cinnamon and 1 tablespoon brown sugar. Pour into a blender in two batches or use an immersion blender to puree, then stir in 1/2 cup milk. Next: Want more recipes your kids can help make? Check out our kid-friendly hummus and brain-booster bars. And while you cook together, listen to “Shape Up Chip In” and the rest of the Q Wunder playlist, available on the Q Wunder app!